I don’t think there’s anything better than the smell of roasting chicken, which is saying a lot since I’m generally a baked goods girl. 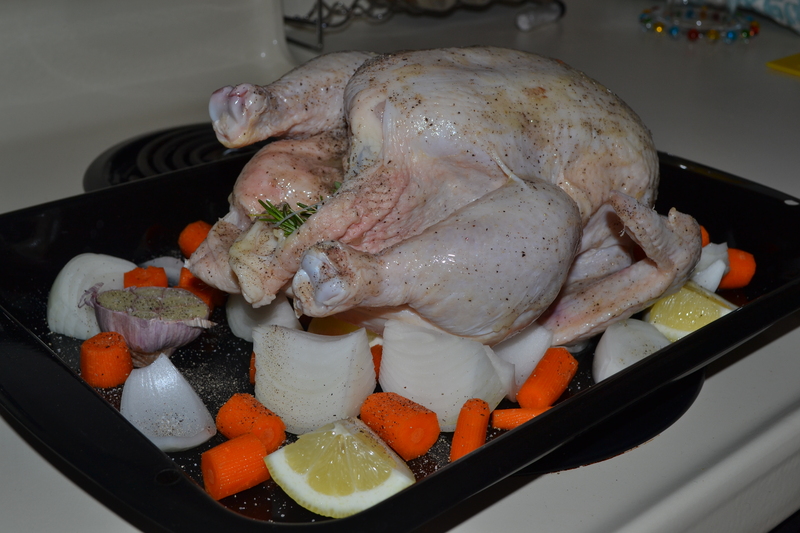 The only smell that can top it in my book is Roasted Lemon and Herb Chicken! You already know I’m not a fan of leftovers, but I can snack on a rotisserie or roasted chicken for days. Things were busy again at work this past week, so that was exactly what I had in mind. 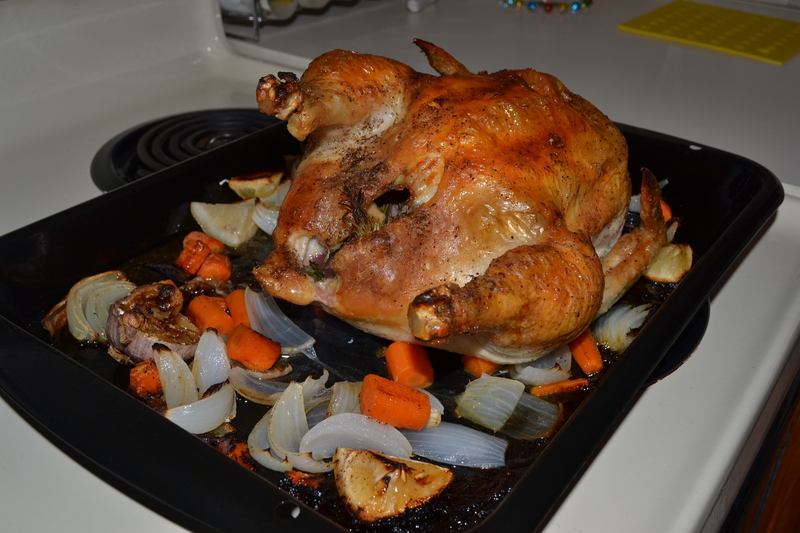 Here’s my quick and easy recipe for roasted, mouth-watering chicken that will feed you for days. Preheat oven to 425 degrees. Peel and chop onion into small wedges. I ended up having three sections for each half onion I chopped. Next cut two unpeeled heads of garlic in half, the cut lemons into quarters. Reserve two quarters of the lemon for inside the chicken. Afterwards, peel and chop carrots into medium chunks, about 2 inches thick. Transfer all of these ingredients into a roasting pan and sprinkle with salt and pepper. Remove all giblets from inside the chicken cavity. Place your bird on top of the chopped ingredients. Sprinkle the top of the bird and inside the cavity with 1 1/2 tsp salt and 1 tsp pepper. Stuff remaining two lemon quarters, rosemary, and thyme inside chicken cavity. Melt 2 tbs of butter in the microwave and spread evenly all over the chicken, making sure to get the legs and wings. Cook in the oven at 425 degrees for 55-60 minutes, or until a meat thermometer reads 165 behind the chicken leg. The juices should also run clear from the holes. 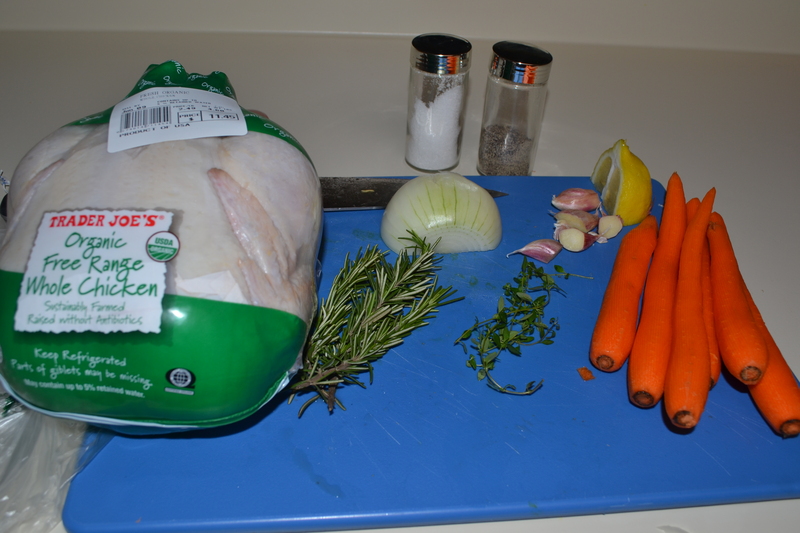 Let your chicken rest for 20 minutes before serving with roasted onions (yum) and carrots. Behold my gorgeous bird! Oh and I bet mashed potatoes would be the perfect accompaniment. Stay tuned for a perfect take two recipe with my leftovers!